A series of unprovoked vigilante attacks on France's Roma community have erupted after false reports spread online about child abductions. But police say the warnings of a "man in a white van" kidnapping children off the streets are "totally unfounded". A police chief in one of the suburbs warned officers of "a psychosis that is starting to set in." Claims of a man in a van abducting children and others - reportedly to fuel prostitution rings or the illegal organ trade - have been circulating online in recent weeks. "Rumours about kidnapping children with a van are completely unfounded. No abductions have been proven," Paris police wrote on Twitter on Monday. "Do not share this false information, do not incite violence," it warned. Monday night's attacks on the Roma community happened in the neighbouring Clichy-sous-Bois and Bobigny areas north-east of central Paris. French broadcaster BFMTV said the attackers had armed themselves with baseball bats, knives, and rocks - and between the two areas, there were about 70 people involved in the vigilante mob. Yet the online rumours have continued to spread - along with video footage of attacks on van drivers "matching" a supposed description of the alleged kidnapper, across several regions. How common are child abductions? French media outlets have debunked images that claim to show a suspicious van "spotted" by a supposed well-meaning citizen – which are sometimes years old, or from a different region. The rumours have parallels to last year's lynchings in India, where several people were killed by mobs based on false videos circulating on Whatsapp, purporting to show abductions. Roma human rights collective Romeurope issued a statement saying: "Anti-Roma racism is, in France, the most widespread form of racism." The "descent of armed men" on the "shanty towns" had left the victims "living in terror", it said, with adults holding watch through the night. Those who drive a van for work "do not dare go out to continue their usual activities". The child abductor in a van - usually a white one - is a well-known, almost stereotypical image. Hundreds of similar reports and warnings abound online from local new outlets across the globe. France's Libération newspaper says (in French) that the story has "haunted the web for years" in Belgium, Germany, and France. It was labelled an "urban myth" by Australia's ABC News as far back as 2009, when a state crime statistics expert said most such reports were false. In 2012, Sweden followed suit, with a detective inspector telling newspapers that the white van urban myth had been around for 10 years - most likely because it was the most common type of van. 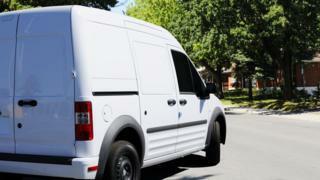 The workman's van in a white colour is ubiquitous on the roads of many nations - to the extent that "white van man" is a well-used phrase in British life. In the UK, there were 1,189 child abduction offences in 2017/18 - 20% of which were committed by a family member, 40% by non-family that the child knows, and the remaining 40% by strangers - about 475 offences. Current UK police advice to children is based on a campaign titled "clever never goes" - warning children that while not all adult strangers are dangerous, they should never go anywhere with an adult unexpectedly - even with those they may already know. How common are child abductions in the UK?